The story of Count Zinzendorf and the Moravians is truly one of the greatest in church history! God used these humble, simple believers to launch the first Protestant 24/7 prayer movement and the first Protestant missionary movement, taking the gospel to the ends of the earth! I believe Count Zinzendorf and the Moravian community are great models for us to learn from, growing together as servant, catalyst leaders; Christ-exalting, Spirit-led, Bible-based, Gospel-dominated, disciple-making, love-saturated leaders following the Lamb wherever he goes! The Renewed Moravian church dating from 1722 is the product of three converging factors. First a religious revival in Germany called Pietism, that brought about a Christ-centered awakening of a seemingly lifeless church. Second the pressure of religious persecution and increasing division amongst God’s people. And third, the personality and anointing of a man named Count Zinzendorf. The new churches arising out of the Reformation had done much to improve the religious life of Europe. However, in the aftermath, much dissension arose, especially surrounding organizational structures of the church, and endless theological debates. Not only did major tensions continue between Catholics and Protestants, but also among the four major Protestant divisions; Lutherans, Reformers, the Anabaptists, and the Anglicans. Although Luther’s conviction and attempt at promoting the doctrine of the priesthood of all believers, the Lutherans of the day were still heavily influenced by the state and church leadership. The majority of the body were still passive listeners. The sacraments became liturgical formalities without power. The 30 years’ war brought massive devastation to the cause of Christ. Yet in the midst of this environment a revival burst forth which came in the form of Pietism, beginning in about 1670 under the pastoral leadership of Philip Jacob Spener, who introduced the small home meetings. This helped to recover the personal, and experiential relationship with Jesus Christ, the inward life of the Spirit that Luther had originally known. Two centers of theological training had emerged in Germany, first in Wittenberg, the center of orthodoxy, and Halle the center for Pietism. Zinzendorf was a child of Pietism and yet was a bridge between solid doctrine and orthodox truth. Zinzendorf was a true forerunner calling the church back to personal and intimate relationship with Jesus Christ in the power of the Spirit. Count Zinzendorf was a wealthy aristocrat, a nobleman by birth. Some call him the rich young ruler who said Yes, giving up his wealth for the sake of the gospel to follow the Lamb wherever he goes. Zinzendorf was born in Dresden and had a godly praying grandmother. He came to Christ at a young age, and was often found in prayer meetings, in his youth following his grandmother’s footsteps. When he was a teenager, he had a powerful encounter with the Lord. In a gallery in Dusseldorf, he saw a painting of the crucified Christ. 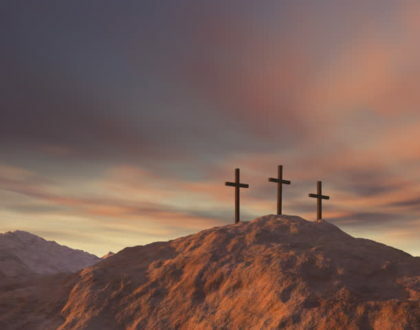 He stared at it for many hours…he saw the blood dripping from every wound, he saw love glowing in every tear, he saw grace shining in every brushstroke…. the artist of the painting had been saved by Jesus from a life of deep darkness and sin, and now he painted mercy in every line, forgiveness in every blood drop…. at the bottom of the painting were the words, “This is what I have done for you, what will you do for me.” Zinzendorf fell to his knees, sobbing, and with all his heart he promised that for the rest of his life he would glorify the Lamb for what he had suffered on the cross! He had been wounded by the wounded one, pierced through by the Pierced one, and scarred by the revelation of the sacrifice of the Son of God! Flowing out of Zinzendorf’s passionate love for Christ came a life disciplined in prayer. “Count Zinzendorf had early on learned the secret of prevailing prayer. So active had he been in establishing circles for prayer that on leaving the college at 16 years of age, he handed his professor a list of seven praying societies” (David Smithers). Also preceding the great Moravian revival of 1727, it was Count Zinzendorf who was used to encourage prayer for a fresh outpouring of the Holy Spirit. At a young age Zinzendorf committed to give his life to see the gospel reach the ends of the earth where it was most needed! Fast forward a few years to 1722, where a group of Bohemian Moravians fleeing persecution, came to this area, many of them risking their lives to get here. They were descendants of the Waldensians, whose motto was a simple life, the Bible in their own mother tongue as their highest authority, no swearing allegiance to the King (state) and bread and wine for the Lord’s Supper. This group was led by Christian David, a carpenter. Christian David was called the Moravian Moses, escorting families back and forth from Moravia to Herrnhut ten times. When they first arrived in Berthelsdorf where Zinzendorf lived, just a mile or so from here..they discovered that Zinzendorf was out of town. Instead, they met with the manager of Zinzendorf’s estate, a man by the name of Heitz, a godly man like Zinzendorf, and he gave these persecuted refugees a place on this land, where we are here today. These Moravian refugees prayed for a place to dig a well on the land. In faith they began to dig. For several days, many of the neighbors from the surrounding area mocked them, yet God spoke, and they believed and finally struck water! It is interesting they have since discovered many fresh water springs and wells on this land. As early as 1699 a well was discovered by those prior to the Moravian settlers in Herrnhut. It was referred to as Isaakbrunnen, meaning the Well of Isaac (Gen 24). Later it was renamed Zinzendorfruh meaning Zinzendorf’s rest. Zinzendorf would often come to this well to rest, spend time with the Lord, and compose hymns. As a picture in the natural, we pray that God would open these ancient wells of Moravian prayer, mission, and revival again in our day for the Glory of the Lamb! When Christian David fell the first tree to build the first home here in Herrnhut, June 17th 1722, he offered a prayer of dedication for this little town, quoting Psalm 84:3, “Even the sparrow finds a home, and the swallow a nest for herself, where she may lay her young, at your altars, O LORD OF HOSTS, my KING and my GOD!” This land was first dedicated to be a dwelling place of the Lord, an altar for the Lord of Hosts! When Zinzendorf returned home he saw a light up on the hill, and fell to his knees, dedicating this little community to the Lord! On May 12th, 1727, after a lecture by Zinzendorf, they signed an agreement, called the Brotherly Agreement to dedicate their lives to the service of Jesus Christ. It was at this point that the Spirit began to move in a deeper way among them. On July 22nd the community covenanted to meet often in prayer and worship, beginning what would later be referred to as the ‘summer of revival,’ for this small Moravian community. At the time of the revival in Herrnhut in 1727, there were 220 people living in 30 different homes in Herrnhut, and 87 of the 220 were children. Zinzendorf took the kids ‘under his wing,’ first in Berthelsdorf and later in Herrnhut. Zinzendorf had a special love for children and youth, since he had experienced God much in his youth. He would spend significant time discipling the children and praying for an outpouring of the Spirit on the children. Her father went the next morning to the Count and told him what had happened. There he heard the news that in the same night, three other girls also experienced revival and had wept for grace. The Count called them all to himself, prayed with them and blessed them. Through their testimony, other children were revived as well. These children along with the adults began praying for a mighty move of the Holy Spirit. I believe it is a powerful testimony that God responded to the prayers of children and youth in releasing an outpouring of the Spirit that led to the first 24/7 prayer and mission’s movement amongst Protestant churches. The revival amongst the children had a great influence on the parents and the rest of the inhabitants. After this outpouring of the HS, the Lord spoke to Zinzendorf from Leviticus 6:13, that the fire should never go out on the altar! Because of the sacrifice of Christ, they should respond with unceasing night and day prayer because of the absolute worth of the Jesus! On August 26th they launched the canopy of prayer with 24men and 24women, committed to an hour of prayer a day. A person would commit to same hour each day. They called this “Hourly Intercession” in response to Christ’s exhortation to Peter at Gethsemane, “Could you not watch with me one hour?” (Matt. 26:40). The list included 7 names of the revived girls, committed to praying 1hr a day and eventually increased from 48 (24 men and 24 women) to 77. Many of these were simple ordinary believers, housewives, craftsmen, bakers, and children. This was also a singing community. They would gather together in the mornings and evenings to start and end their day in songs of praise as a community. Zinzendorf was a prolific songwriter, writing and composing 1500 plus hymns! During an evening service, May 3rd, 1728, Zinzendorf gave them a verse from Scripture, a watch word for the next day. The Moravians who had been at the service took this word to the 30 plus homes and exhorted them to use this verse for the next days’ prayer and worship focus. These watchwords were compiled and eventually published in 1731, one for each day of the year, called the Daily Text. Zinzendorf would also gather the committed ‘hourly intercessors’ once a week to share prayer points. Prayer was primarily outward, kingdom focused prayer. Rather than simply praying for individual needs, they would cry out for other communities, for missionaries on the field, and for the gospel to go forth in power. The Moravians recognized themselves in debt to the world as the trustees of the gospel. They were taught to embrace a lifestyle of self-denial, sacrifice and prompt obedience. They followed the call of the Lamb to go anywhere and with an emphasis upon the worst and hardest places as having the first claim. No soldiers of the cross have ever been bolder as pioneers, more patient or persistent in difficulties, more heroic in suffering, or more entirely devoted to Christ and the souls of men than the Moravian Brotherhood. The Moravians beautifully explain their motivation for missions in the following 1791 evangelical report. Zinzendorf stated his missionary theory along three lines: 1) First the missionary was to live humbly among the people and not dominate them. 2) The crucified Christ was to be the focal point of preaching and teaching. 3) The missionaries were not to seek the conversion of whole nations but were to look for the man of peace in a community and search out for individual seekers. They would disciple men and women calling them to make disciples worth reproducing! Part of Zinzendorf’s missionary philosophy was called ‘first fruits.’ His belief was that the wholesale conversion of the world would have to await the prior conversion of the Jews grafted back into the one new man (Romans 9-11). In the meantime, the gospel would go forth and many first fruits of believers would be discipled, and churches planted in every nation (people group) on the earth! The Moravians had learned that the secret of loving the souls of men was found in loving the Savior of men. On October 8,1732, a Dutch ship left the Copenhagen harbor bound for the Danish West Indies. On board were the two first Moravian missionaries; John Leonard Dober, a potter, and David Nitschman, a carpenter. Both were skilled speakers and ready to sell themselves into slavery to reach the slaves of the West Indies. As the ship slipped away, they lifted a cry that would one day become the rallying call for all Moravian missionaries, “May the Lamb that was slain receive the reward of His suffering.” The Moravian’s passion for souls was surpassed only by their passion for the Lamb of God, Jesus Christ. There were a handful of missionaries that God raised up prior to the Moravians. 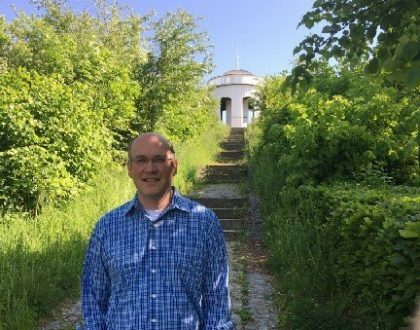 Many look to William Carey as the Father of modern missions, and yet the Moravians are considered the first protestant denomination to launch themselves wholeheartedly into missions! 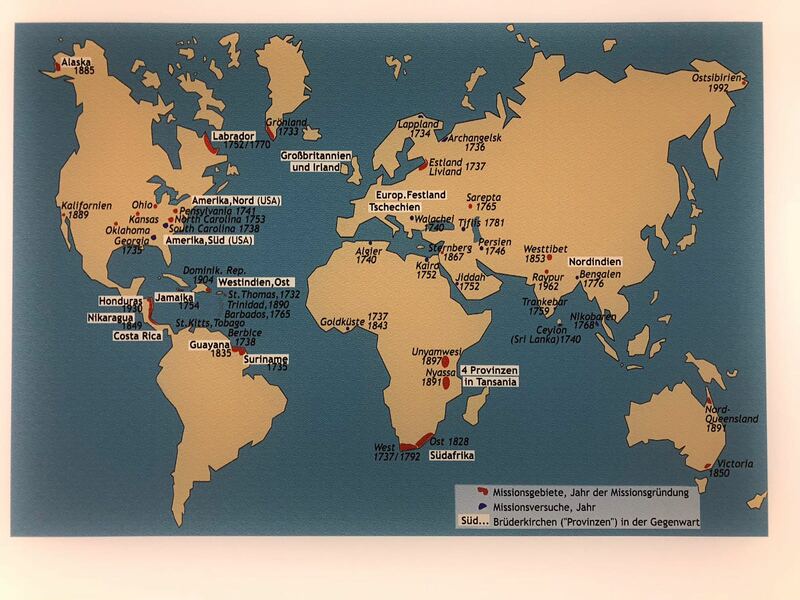 When the Moravians celebrated their Jubilee, in 1782, it reported 27 missionary societies had been established and 165 missionaries spread from the Artic to the Tropics, and from the Far East to America! In total, 226 missionaries scattered around the world. Each were tent-making missionaries going to serve communities first with their trade and working among the people. It is estimated that these missionaries helped to establish over 5000 missionary settlements across the globe! The Moravians loved the whole church and were often referred to as the ‘church within the church.’ Zinzendorf encouraged the Moravian believers to stay connected to the Lutheran church in Germany and yet maintain their pietistic gatherings and small missional communities. Many went to cities throughout Europe to come alongside the church and make disciples worth reproducing! This became known as the Moravian ‘Diaspora.’ An example of their discipling influence was helping to shape the life of Dietrich Bonhoeffer. Two Moravian sisters Kathe and Maria Van Horn came to live with the Bonhoeffer’s after Dietrich was born and for two decades they formed a vital part of the families discipleship to Jesus, watching and educating the children! The Moravians experienced a deep sense of community, maintained through small groups based on common needs and interests, original and unifying hymns and continual prayer meetings. In 1738 John Wesley visited “this happy place” and was so impressed that he commented in his journal. “I would gladly have spent my life here . . . Oh, when shall this Christianity cover the earth as water covers the sea?” Several years later, Zinzendorf released 12 Moravian missional communities in England into the hands of John Wesley, who he recognized had the leadership anointing to plant churches. This helped to serve and establish the Methodist movement in England. God used Zinzendorf again as a humble servant leader! What would this look like for the global leadership CRU to come alongside other ministries and churches as servant catalyst leaders? By no means was Count Zinzendorf’s life flawless, but one cannot help but be moved by his consuming passion and pre-occupation with the person of Jesus Christ. A glimpse of his burning love for Jesus can be caught in the following letter. “Nevertheless, I have this against you, that you have left your first love. Remember therefore from where you have fallen; repent and do the first works…” (Rev. 2:4-5).